USS Langley (CV-1), originally named Jupiter, was built in 1911 and was the first electrically powered ship, and the first aircraft carrier, in the U.S. Navy. She was awarded a noteworthy nine battle stars for her service in World War II before being sunk by her own destroyers after she was too badly damaged to salvage. She was also the first ship to pass through the Panama Canal from West to East. Prior to and during World War I, USS Langley (named Jupiter at the time) operated off the west coast of Mexico. When the war began, she made her journey to the East Coast and transported coal to Europe. She also brought returning servicemen home to the US from Europe. 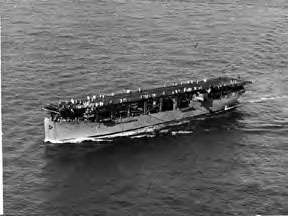 Langley was renamed and converted into an aircraft carrier — the very first one in the Navy. She ushered in the era of the aircraft carrier with test flights conducted in the early 1920s. In 1924, she joined the Pacific Battle Fleet, operating off the coast of California and Hawaii and helping to train fleets and pilots. In 1936, she was converted to a seaplane tender. USS Langley was part of an antisubmarine force in the South Pacific, operating off the coasts of the Philippines, Borneo, Australia, and Java. On Feb. 27, 1942, Langley was attacked by three enemy strikes. The third strike damaged the ship beyond sea capability and set fire to the planes on her decks. Sixteen men were lost. The ship was abandoned by order and the accompanying destroyers sunk her 75 miles south of Tjilatjap, Java.